Proto-Pasta Conductive PLA is easy to print and can be used on any 3D printer that can handle PLA filament. This conductive filament is ideal for low voltage circuitry and can even power a low current Arduino. So how does this filament compare to regular PLA? Great question - this conductive PLA filament will print objects that are more flexible than normal PLA but have less layer adhesion. It can be characterized as semi-flexible and should be kept at temperatures below 50C. If you decide to use this material in a dual extruder, we recommend printing it with regular PLA since they stick well to one another. 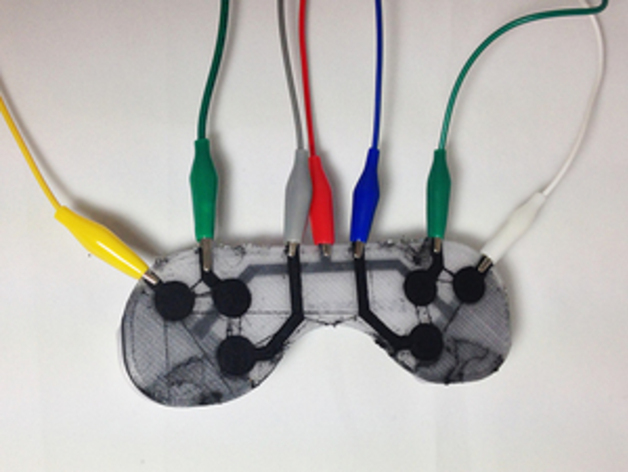 Makey-Makey game controller printed with Proto-Pasta Conductive PLA. You might be asking yourself, just how conductive is this filament? Below please find the various measurements of conductivity as provided by Proto-Pasta.